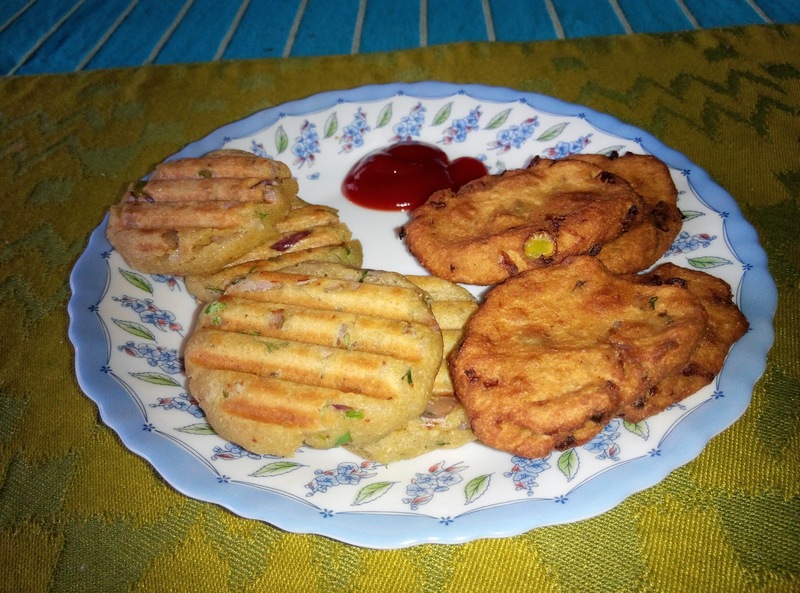 All flour vada or vada with all flours is a healthy snack item for anybody. We can make it instantly. The only important thing is we should have all of them on hand. This recipe I got a clue from Maharastrian Bajan flour. We have to prepare it with whole grains. But this vada we can use the flours directly. Very simple and tasty and of course healthy evening snacks. We can shallow fry them or we can also toast them toaster grill. I made them in both ways. Kids also love them very much. We can add some more vegetables also like grated carrot, mint leaves, peas etc..
Chop onions, green chillies and coriander leaves. Mix all the flours add salt, red chilli powder and garam masala powder. Add chopped onions and green chillies to the above flour mix. Add water and make dough out of it. Make small patties or vadas and fry them in the oil. We can toast them also. I fried some of them in the oil and toasted some in the toaster. Anyone can find the difference. That's all all flour vadas are ready to serve. Serve them with tomato sauce.